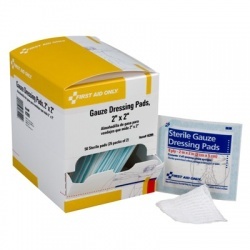 Gauze Dressing Pads can be used to apply any topical cream to a burn or wound, without contaminating it to avoid infections. 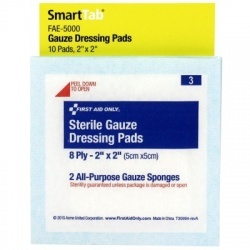 Gauze dressing pads, held down by a first aid tape or bandage wrap, can be used to cover wounds that are still bleeding or draining to absorb the fluid. Wholesale-Direct offers different sizes for any kind of need. 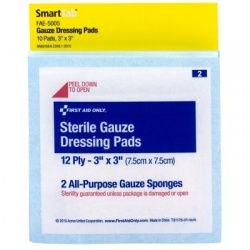 Gauze Dressing Pads There are 28 products. 2"x2"Gauze pad, 3 packs of 2 pads/Case of 6 @ $0.95 ea. 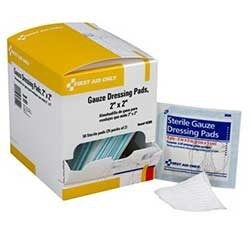 2"x2"Gauze pad, 3 packs of 2 pads/Case of 6 @ $0.95 ea. 3" Compress bandage, off center/Case of 6 @ $2.75 ea. 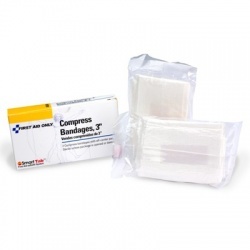 3" Compress bandage, off center/Case of 6 @ $2.75 ea.